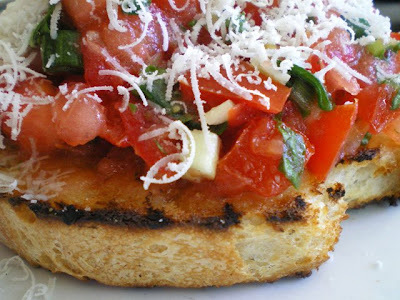 Bruschetta has become my go-to appetizer. It's dressed to impress, but easy enough for my Hot-Pocket-loving sister to make. A bottle of wine, a few good friends and a plate full of bruschetta will kick start any evening. Bruschetta (serves a bunch!) 7-10 roma tomatoes (or heirloom tomatoes if you have them) 3 cloves garlic 1/2 shallot Kosher salt Olive oil Balsamic vinegar Fresh basil leaves Parmesan Fresh, crunchy bread (Baguettes work great) Dice tomatoes, garlic and shallot. Combine in a medium bowl. Stir in olive oil and a splash of balsamic vinegar. Tear basil leaves over mixture (be sure to smell your hands. It's delicious.) Season with salt to your liking. Lightly butter slices of bread and toast for 3 minutes in the oven. When crispy, remove and top each slice with tomato mixture. Grate Parmesan cheese before serving.